Looking for a small home improvement that yields big results? A programmable thermostat, properly installed and configured, helps maintain a comfortable indoor temperate while reducing your home’s overall energy usage. Several factors come into play when choosing a thermostat: how much flexibility you want in the programming, your voltage requirement, and the type of heating and cooling system you have. You must also decide on a user interface. Yet another consideration is what style of mounting system suits your installation. Cool Only. This works only with a single cooling source. Single Stage Heat/Cool. This type of thermostat controls one heating source and one cooling source—for example, a baseboard heating system and a central air conditioning system. Multi-Stage Heat/Cool. This type of thermostat is used to control multiple heating and cooling sources—for example, a heat pump with a supplementary forced hot air backup system, plus an air conditioning system. Electric Heat/Line Voltage. This type is used to control electric heaters or electric baseboard systems. Heat Pump. Heat pump applications require a specialized thermostat that can handle air-source heat pumps and ground-source heat pumps. Fan Coil. This type works with fan coil units, such as unit ventilators. Millivolt. This type is used to regulate systems that utilize a pilot light rather than an electrical circuit (e.g., a gas-fired heater or gas fireplace). Programmable thermostats are a desirable alternative to non-programmable models, because they allow the user to heat and cool the home based on a specific schedule. Most programmable models have four “set points”. These allow the user to define different temperatures for morning, daytime, evening and overnight. Some thermostats offer 24-hour programmability. You can also establish different programs for different days of the week. A “7 Day”-style programmable thermostat enables you to have a different program for every day of the week. With a “5-1-1” model, there is a five-day program for Monday through Friday, plus a program for Saturday and a different program for Sunday. A “5-2”-style thermostat gives you a five-day program for the work week, plus a two-day program for the weekend. Most programmable thermostats also feature a manual mode, allowing overrides to whatever program may have been established already. All thermostats run on either line voltage or low voltage. Low-voltage thermostats are connected using very thin doorbell or speaker wire. Line voltage thermostats require a heavier wire. Also available are wireless thermostats. Indoor and outdoor remote sensors can be found easily, as well. Many new thermostats are able to be programmed via internet, smartphone, or tablet. Some thermostats come with an auto-changeover switch, which shifts the unit between heating and cooling automatically, depending on the indoor temperature. Other styles must be manually changed from heat to cool and vice versa. Non-programmable thermostats typically have a mechanical user interface—either a rotating dial or a sliding lever. Programmable thermostats come with either a digital button and digital screen interface, or a back-lit digital touchscreen interface. Face plates and mount styles can be horizontal, vertical, or round. 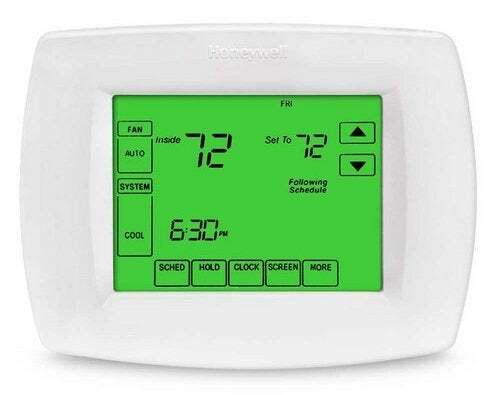 Online retailer SupplyHouse.com sells a wide variety of programmable thermostats, including leading brands Honeywell, White Rodgers, Robertshaw, Lux, Wirsbo and Tekmar. It also offers accessories, such as wireless interface modules, trim plates, and temperature sensors.